Kirk, Cathy, and Vicky have shared many of their favorites with the rest of us over the years. This post, however, is ed (from Yuma) sharing one of his. After having a couple of way-too-salty meals, I have quit eating here. Reports are that the place has declined. I know that one or two of you who are familiar with Yuma will think that this is not a new restaurant at all--since Yuma has had an Indian eatery at this location on 4th Ave now for several years. In fact, you have to look closely to realize that this is a different Indian restaurant -- and to my taste buds at least, a much better one. The chef was born in Nepal, but she is skilled in cooking a wide range of Indian dishes and has spent many years sharpening her culinary skills by cooking for her Indian husband. Often, in fact, when I eat at the restaurant, I feel like I can dining in somebody's home because the food is made with love and with great attention to detail. One never knows what one is going to find on the buffet. I have had a standard daal maharani, a yellow daal, and most recently an herbed daal unlike any other I can recall tasting elsewhere. This curry, was primarily spiced with the subtle tastes of turmeric, roasted cumin seeds, and garlic -- all of which serve to accent the wonderful flavor of the chicken. This dish featured layers of flavors, with the curry spices offset by creamy and tangy yogurt. The textures of the dish also ranged from soft through chewy to crunchy. "Curry leaves," she said, "but you have to burn them to get the right taste." And you know what, she was correct. The touches of burnt flavor contributed to the overall balance of the shambher. My main concern with the restaurant, however, has to do with its survivability. We all know that having a skilled and creative chef is only a small part of the battle that every independent restaurant faces. 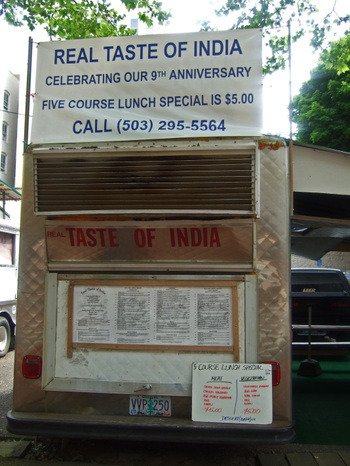 I worry that too many locals and winter visitors alike associate India Palace with the defunct India House, a restaurant that was uniformly mediocre for the last few years of its existence. I also worry that some lunch diners will associate the lack of quantity and daily variety with a lack of quality. 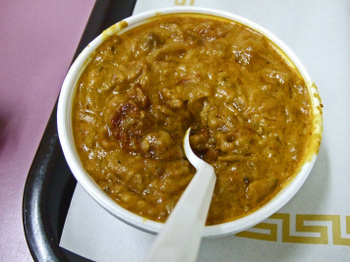 I just hope that more people appreciate the unique flavors that India Palace brings to the Yuma dining scene. I hope. 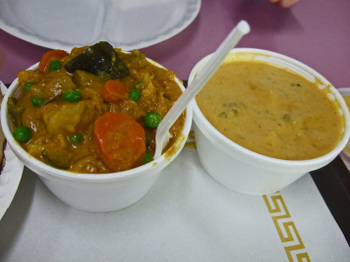 India Palace, 2071 S.4th Ave., Yuma, AZ, (928) 782-0799. Sunday Stuffs: San Diego Food Blog Search, Who said you can't get crisp sweet potato fries, and I take direction well. The San Diego Food Blog Search. And if you're a San Diego Food Blogger, and I have somehow missed you, please let me know.....I managed to add 48 food blogs, but am pretty sure I've missed a few. I know I should do more with regards to making things more useful....but it seems I'm always busy eating!!! Who said you can't get crisp sweet potato fries? Well, I recently had some pretty darn good sweet potato fries, that were crisp, and tasty. I managed to save some for the Missus, and was even given some specific instructions on how to reheat them. Of course, the Missus disregarded the instructions, but enjoyed them all the same. So where did I get these? Previous posts on Crab Hut can be found here and here. Leave it to the Missus, after my post on Surati Farsan, and my mentioning how Indian Cuisine was something She needed to be in the mood to have....she was suddenly....in the mood. So we headed off for Surati Farsan. 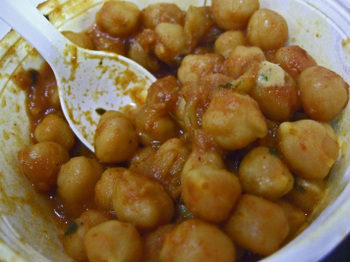 The Chole which could be described in the most simplest terms as a chickpea curry, was nice with some savory-spicy overtones. It was perhaps a bit too sweet for my taste, but when I made sure to include the onions in every bite, it became an excellent dish. 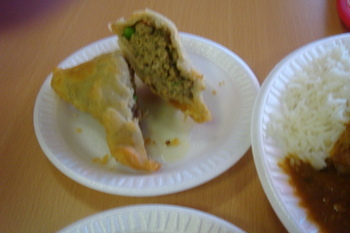 The samosa was fried to perfection, and filled with vegetables, added more of a nice textural counter-point. Yes indeed it is the one and only.....potato potato patty "burger". They come two to an order at Surati Farsan. Nice potato flavor, mildly spiced, and crisp around the edges.The bun was quite a simple burger bun-ish, but there was a nice smear of a garlic chutney. You can also get you Pav Vada with cheese! The Missus loved the potato croquettish patty, I loved the chutney, and got many happy returns from it the entire afternoon (too much info, I know). Not quite sure if I'd get this again.....but it was amausing to say the least. So what did the always adventurous Missus get? My previous post on Surati Farsan can be found here. *** A short update can be found here. As I mentioned in my post on Punjabi Tandoor, we kind of have to be in the mood for Indian Food. And after our trip to Cambodia, the Missus found Herself wanting some Indian Food. But that window is usually pretty small, and after a couple of visits to Surati Farsan, it seems that the window has closed. So, here's another C(lean) O(ut the) M(emory) C(ard) post from visits back in June of last year. I'll keep it short and sweet. From what I've read Surati Farsan specializes in vegetarian snacks, and sweets from the state of Gujarat, and you can find a ton of posts on Surati Farsan on Chowhound, and elsewhere. On our three visits from last year, all of the customers were Indian, though I'm sure much of that has changed. There are basically two reasons we come to Surati Farsan...the Dosas...and the Dosas, and no matter how hard we try, we just can't break our habit of getting those Dosas. I did try to break away once, and tried the special "Thali of the Day." 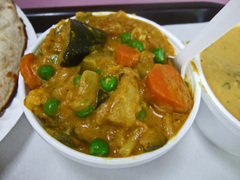 But was disappointed, both in the dishes, which I found a bit off-balance in flavor, and lacking in complexity, and myself, since Indian Cuisine fills me up quickly, and I could hardly put a dent in this. The Missus always goes for the Masala Dosa, which seems to stretch from one end of the table to the other. The rice batter crepe is wrapped around what amount to a potato subzi. It is mildly spicy, fairly rich, and within all of this, the potato flavor is not lost. Over the years it seems that both the Missus's and my tastes have converged. We tend to like the same flavors, and often reach the same conclusions about what we eat. And for the Masala Dosa we find the overly sweet coconut chutney detracts from the flavor of the Dosa. Wonderful Dosa wrapped around a fiery concoction. In this case, the coconut chutney helps to cool the burn, and the sweetness of the chutney adds to the complexity of flavor. As I've said many times, Indian Cuisine is still pretty much a mystery to me. Though the first time I tasted that Sambhar it rung a bell......I remember having a similar Sambhar in LA...and lo' and behold, Surati Farsan has a branch it Artesia...could it be? We have had problems stretching our wings here. We love the Dosas, and don't want move on. Though we've tried, as in the case of the Bataka Vada. Think of it as a croquette or fritter, made with a wonderfully flavored mashed potatoes. I enjoyed the cilantro chutney with these, but could only finish two of them, and half my Mysore Masala Dosa. I'm not quite sure when the Missus will again want something from Surati Farsan Mart. But let's try this; I know there's a bunch of you out there who love the place..... why don't you help us decide what to order. We may visit next week, next month, or next year, but we'll make sure to try what you recommend! mmm-yoso!!! 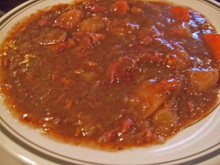 is the blog about food and Cathy is here again today. I have been having strange food cravings this summer. I vacillate between Indian and Mediterranean food. Some days I want both. Little did I know that this new restaurant was opening... Special thanks to Kirk for the title. It is descriptive. Hi. So, anyhow, it's Thursday at 4 a.m. I go outside to get the paper. 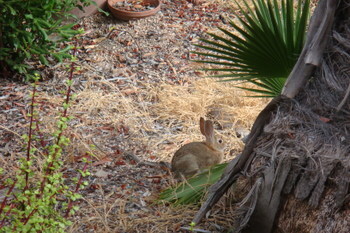 Say good morning to Fricassee, the cottontail who seems to be living in my front yard, and start to read. I get to the "East County Dining" section. Indian and Italian Food. " There I was thinking Italy and India were, like, two continents apart. How can these two types of food and cooking possibly be served in the same restaurant? We had to. Oh, yes we had to. The place smells heavenly when you walk in the door. Crust was excellent. Meat and fillings (celery, peas, carrots)fresh. Not very spicy. Unfortunately my least favorite item, but not bad. 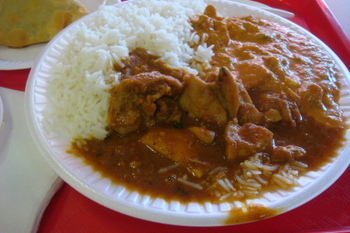 The three item combo - choose from what was on the steam tray ($7.99) Chicken tikka masala-excellent. 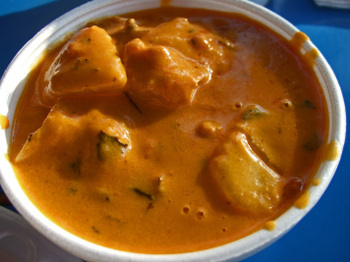 Spicy chicken curry-nice heat and still the ability to taste all flavors. Turmeric, cumin, onion, cinnamon and ginger stood out, but there were more. A lot of chicken meat in both. Excellent basmati rice. The third item was meat lasagna-excellent. Cheesy as well as meaty with a good tomato sauce. 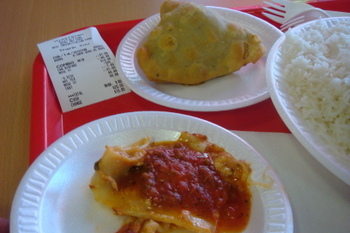 There is a photo of the intact samosa. 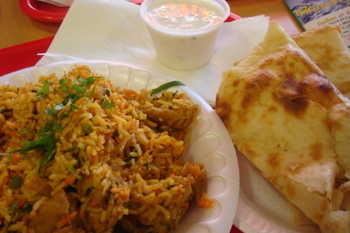 The three item combination comes with rice and fresh made naan. Fresh made. Whatever oven they use to make the naan, they use for the pizza and calzone. The crust is sweet, crunchy and chewy. The fillings are cheeses (Mozzarella, ricotta and parmesan) fresh made, tomato-y sauce. 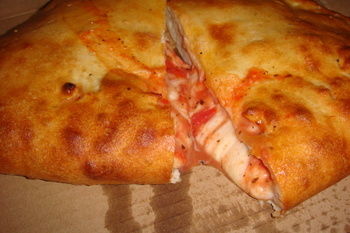 There is a meat lover and pepperoni calzone available as well-same price. Really really good, fresh made (not on the steam tray). Buttery (with ghee) rice, nice heat level, at least three chicken thighs. Shown with the naan and raita (yogurt sauce-with cucumbers and carrots). 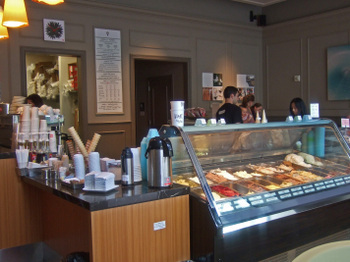 The owners are very nice, friendly, efficient and professional. 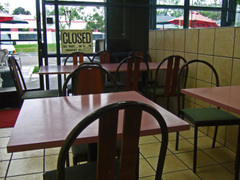 The seating area is small (6 booths, 3 tables). They make both cuisines quite well. 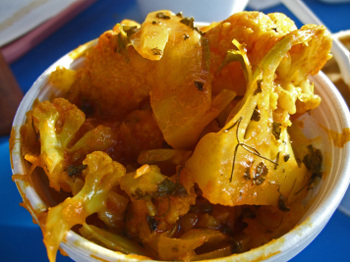 The website states they are trying to make healthy foods and touts the benefits of the Indian spices, as well as the healthy aspects of the Italian foods and the many vegetarian products available. 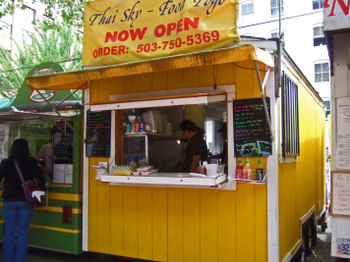 The food is extremely fresh and high quality and plentiful. It's in East County-close to home and my cravings! website The website has coupons! 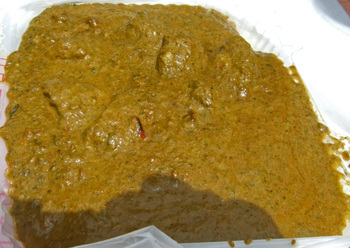 A quick warning, this post is quite long, so you may want to check out moowiesqrd's more concise post on Punjabi Tandoor, found here. I'll say this upfront, we know almost nothing about Indian Food. 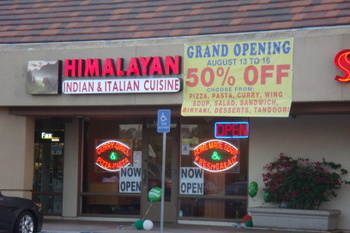 In fact, it used to be that the Missus had to be in a particular "mood" to eat Indian Food in San Diego. She'd often find the offerings to be; "butter intense", "too cheesy", "too fatty", and basically "too rich". But after eating Indian Food in Siem Reap, the Missus found Herself craving it upon Her return home. And one of the places mentioned in Chowhound, among other places, was Punjabi Tandoor. In several of the posts and comments I was quick to pick up phrases such as "my Indian friend says", which along with statements like, "I'm Chinese so I should know" always raises more questions than answers with regards to diverse cuisines. But an acquaintance of mine(who has since moved on) who is from the State of Haryana, MrR, told me that the food at Punjabi Tandoor was "humble, but quite good". Which I thought was a nice recommendation, just one of many; until I checked a map and found that Haryana is the State directly to the South of Punjab, and from what I remember reading, was originally carved out of the state of Punjab. Unfortunately, MrR moved on to, hopefully, greener pastures before I could get some specific recommendations, so we were left to our own machinations. Punjabi Tandoor is not found in San Diego's "Little India" on Black Mountain Road, but a bit further down the street and to your left on Activity Road. The location is a bit odd residing amongst the generic prefab offices and buildings in the area. 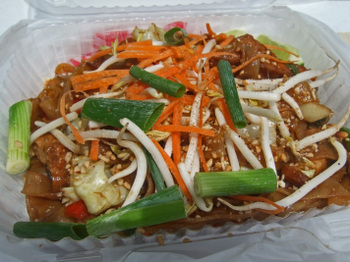 The restaurant is a mostly take-out joint, no frills, and the food served in, or on Styrofoam. The heady herby fragrances are everywhere once you enter the tiny restaurant. The menu is quite large, and can be a puzzle if you haven't much experience with Indian food, but the staff has always been nice and helpful....somewhat helpful. There are also different "specials" listed on a greaseboard alongside the cash register. So here's a brief rundown of various dishes we've tried at Punjabi Tandoor. If you're thinking "Onion Rings", you wouldn't be far off. These were fried to perfection, in a nicely seasoned, lacquer-like batter. 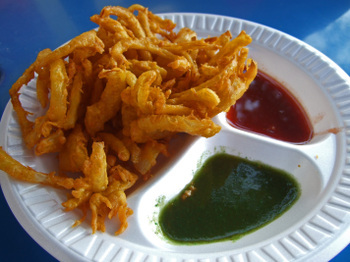 Served with the standard green and red chutney, we polished this off in no time at all. What we enjoyed most of all, was that you could make out the sweet flavor of the onion. This was one of the "greaseboard" specials. Once I found out that Bakra (bakara) means goat, we were all over this dish. On the each of the 3 occasions we had this dish, the meat was very tender and moist. It could stand to be a bit more gamey in flavor, but it was fine. 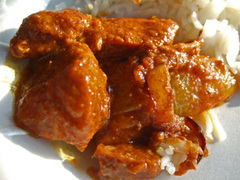 The depth and breath of flavors was excellent.....tangy, salty, with a slow building spiciness that was very pleasant. There was a nice layer of fat on the top, but the result was a definite "fei ur bu ni", "rich without being greasy". This was nice, not too wet and mildly spicy. At most steam-table joints, the chickpeas will be overcooked and mushy. In this case it was the opposite, the chickpeas were almost too hard. Eggplant that is first baked, mashed, than cooked with various herbs, onions, and tomato. This had a nice, rich, velvety texture, and good spice. It also stayed molten hot for quite a long time. Great with Nan. 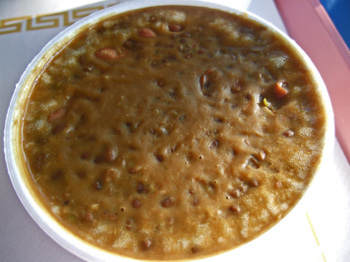 Dal Makhani ($3.95). We had this twice, the first time, it had a nice smoky flavor, was mildly thick, and was very nice. The second time, the dish had a thick "skin", which was nice, but it was very thick, and tasted too "milky". 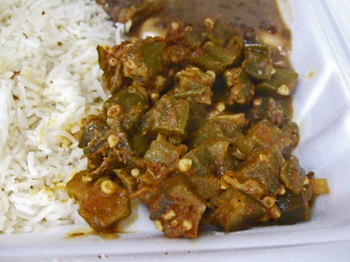 The Okra was cooked to perfection, but the flavor was out of balance....just plain spicy, and not much else. It did taste better the next day. The Missus loved this dish. 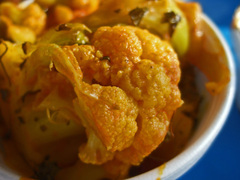 The Cauliflower and Potatoes were cooked perfectly. I barely had a shot at this one. Per the Missus, "there's a lot going on here....."
The Garlic Nan($1.95) was not very good on the day we tried it. It was incinerated and bitter. This was a serviceable Nan....nothing out of the ordinary. This was a bit puzzling to me. 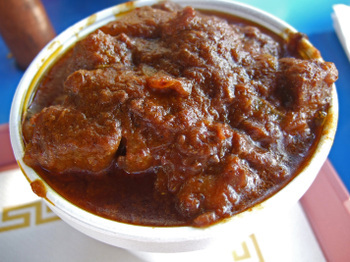 I've had Vindaloo before, and it usually has a tangy-vinegary flavor, along with a good amount of spice. This had a "cheesy-sour" flavor, and wasn't spicy in the least. The dark meat chicken was excellent though, I could cut it with my plastic spoon. The Korma was mediocre, almost bland. The Malai Kofta "sauce" was very creamy, both in texture and taste. The Kofta, fried cheese-vegetable balls, had a nice flavor, but were on the dry side. So there you have it, a nice sampling of dishes from Punjabi Tandoor. Punjabi Tandoor may not fit the bill as a place for and "evening out", but most of the food is well flavored, and balanced, and the prices can't be beat. When I asked my In-Laws where they wanted to visit on this trip to the Mainland, they said Seattle. They also said they wanted to go by train....... Which was no problem really, I've taken Amtrak's Coast Starlight several times, though my trips have always been from Seattle to LA. So what we did was send off the In-Laws on Amtrak, and leave on a flight the next morning since the Coast Starlight takes about 36 hours to reach Portland. We arrived a bit early, and got to our hotel at about 1pm. Since the standard check-in time is 3pm, I thought we'd check our luggage, get a bite to eat, and stretch our legs a bit. When we arrived I went to the Bellman and asked to check my bags. In the typical Portland manner, he told me, "that would be fine, but why don't you just check at the front desk, your room might be ready." And to my surprise our 2 bedroom suite was ready. Seems like my lucky day. After freshening up a bit, we were starved, and just wanted something quick to eat...and I knew just the place! 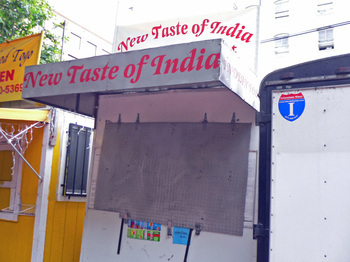 But from the "Real" Taste of India a few carts down. Talk about competition! 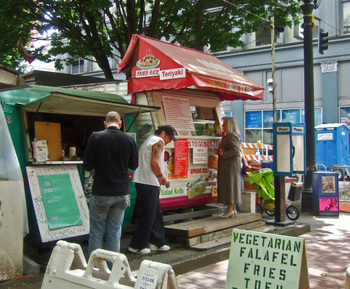 Now this food cart had a 9th anniversary special going on....some chicken-something or other, but the Missus was in the mood for lamb, and ordered the Lamb Saagwala, cubes of lamb cooked in a spinach, garlic, and ginger sauce/stew($7.00). I ordered this at medium heat, and it was a bit hotter than what I consider medium. The noodles were done well, they where a nice al dente. The flavor was interesting, I'm use d to Pad Kee Mao that's had a bit of a sweet flavor, this version just had a mild soy(not fish sauce) flavor. Still, it did the job, which was to hold me over until dinner. There's a ton of construction on 5th and 6th avenues for a new Max rail line called Green Line which will connect Portland State University to Union Station. 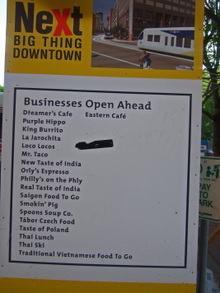 So signs like the one on the right are on Evey corner listing the businesses. Did I mention that I love the public transportation system in Portland? At about this time the Missus got a call from Her Mom telling Her that their train had been delayed about 2 hours. so we decided to take a walk around Portland. And after doing a bit of window shopping, the Missus told me that She needed "something sweet". Which was no problem since we were just up the street from Mio Gelato. This coffeeshopish looking Gelato joint had always been full everytime I passed it on my last trip to Portland, so I figured it must be worth a try. The Missus did the ordering, so we don't remember the prices. But She got one scoop of Grapefruit, and one scoop of Mango. Not being much of a "sweets" person, I found the Grapefruit to be very much to my liking ( all credit to the Missus here). Refreshing and palate cleansing, it was very nice. 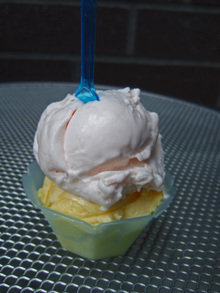 Both the Missus (who has a sweet tooth) and I found the mango gelato to be overly sweet and rich, which overpowered any mango flavor. Still, I can see why this place is very popular. As we made our way back to the hotel, the Missus received another call from Her Mom saying that the train is further delayed...bummer! And though the Missus's Parents were not as late as we thought, by the time we got them settled, and something to eat (they have an aversion to eating in restaurants), we were very tired. So with some reluctance we crossed Biwa off our list, and walked on over to Kell's 2 blocks away. 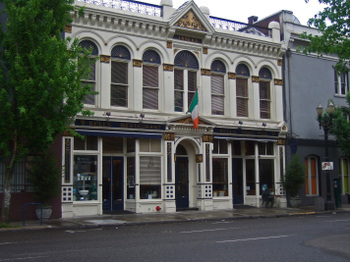 Having been to Kell's in Seattle, I knew more or less what to expect, and really won't go into details here. Though as always, the Missus asked if they had some rice for Her Irish Stew(maybe one of these days they will) which was pretty good. 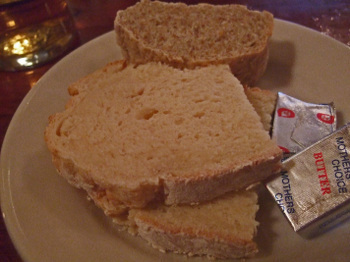 And She enjoyed the soda bread. Everyone was ordering sandwiches and burgers, but I ordered the Fish and Chips which were pretty bad. 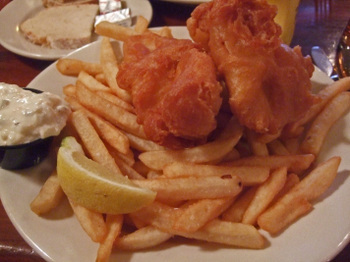 The fish dry and flavorless, and the chips are basic "industrial" fries. Still, that draft Boddington's was nice, not overly chilled, but a perfect "cool", nice and mildly creamy, with a sweet finish. After a sip, the Missus decided that She wanted the Boddington's, so I ordered a Harp, which I thought would be too bitter for Her, but after a sip She decided that "this" was Her beer. So I finished with a draft Guinness, which I know the Missus won't touch. Strangely, it tasted over carbonated and very dull in flavor. 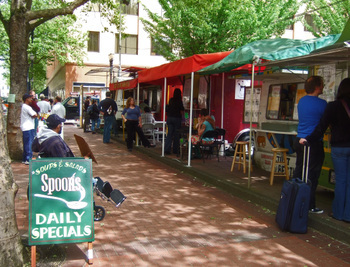 Oh well, we were still in Portland, and had another whole day ahead of us! 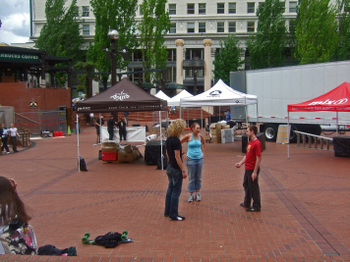 We were taking a break at Pioneer Courthouse Square, just having a seat to rest our feet a bit. And we noticed amongst all the construction, there seemed to be a major "to do" being set-up. We were wondering what this event was. Just about that time, a Police Officer happened to walk past, and the Missus decided to ask him. Now usually we'd get a gruff "I don't know", or some distracted answer.... But this Gentleman replied; "I'm just on duty, so let me find out, I'll be right back..." Which made me feel really bad, I didn't want to be taking up His time. A few minutes later, He's walking back to us, and is talking on a cellphone. As he walks up to us, we can overhear that he's asking someone our question! Now, I'm really feeling guilty, since I'm sure he has more important things to do..... By the time he reached us, I could tell that he'd made a few calls, and he explained to us, what this was. Funny thing is, neither the Missus nor I can remember what event this was. But we sure remember that police officer! As I tried to mutter an apology for taking up his precious time, he smiled and told me, "well, you may be the first person who asks me what is going on here, but you probably won't be the last. So I better know what's happening." As he left, he introduced Himself and shook our hands..... So here's to you Officer Thompson! You're a great ambassador for the City of Portland! Many consider the Mission Valley area North of the 8 Freeway stretching from Fenton Parkway until Old Town to be Chain Restaurant and Fast Food Hell. In fact, Ed from Yuma in one of His most inspired moments described a certain area of Mission Valley this way; "From a chowhound standpoint, Hotel Circle may as well be one of Dante's circles of Hell." Has to be one of the best lines I've heard. At first glance all you see is PF Chang's, California Pizza Kitchen, Cheesecake Factory, Carl's Jr, Bennigan's, Fuddruckers, and the Food Courts from the 2 shopping centers that occupy a large portion of the valley. But there are a few interesting choices in Mission Valley. Tandoor Indian Cuisine, formerly KC's Tandoor, is located in the Ralph's and Long's strip mall bordered by Mission Center Road and Friars Road. In fact, this was the restaurant that made the Tandoori Chicken that the Missus was so infatuated with, and eventually burned-out on that I mentioned in an earlier post. Now, with Indian food back in our rotation, we finally paid a return visit to the latest incarnation of this Indian Restaurant. 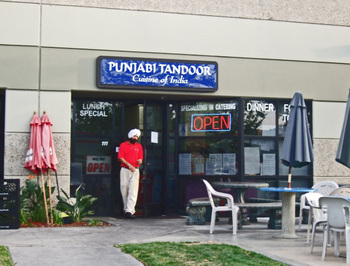 Tandoor Indian Cuisine, is one of several little restaurants huddled together forming a "food court" of sorts in the middle of this strip mall. As a matter of fact, a new location of El Portal is a few doors down from Tandoor. Though the ownership of the restaurant had changed, other then an expanded menu, just about everything else seemed the same. Unfortunately, this includes the aloof and sometimes downright rude service. As in: "can you hurry up and make up your mind and order", when there's no other customer in the restaurant except me. I guess it's "Mission Valley Burnout" caused by crazy lunch hour traffic. "Don't go away mad; just go away...." You know, I rather enjoy eating meat, but don't take pleasure being treated like a piece of it! 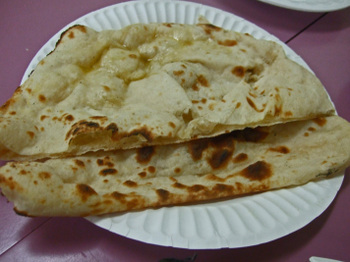 All combination plates also include a piece of Naan. There were 2 small thighs and 2 small drumsticks, that were moist and tender and cooked in the tandoor located on one side of the restaurant. (White meat .75 more each piece) Today, the slightly charred areas of the chicken tasted good (cancer be damned!!! ), though the overall flavoring of the chicken was somewhat bland, and not as good as we recalled. The distinct mildly smokey taste we remembered was missing. As the Tandoori chicken here has never been especially spicy nor herbaceous, any missing flavor component was especially evident. 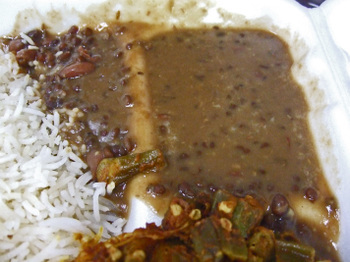 The rice was dry, and the Dal, was well dull, just overly watery. Along with the Lamb, the plate included Naan, Rice, Dal, and Raita(yogurt and cucumber dip). The lamb was very soft and tender, the Missus enjoyed the flavor of the lamb and curry, which I thought was a bit on the watery side and found the tomato based curry a bit odd. 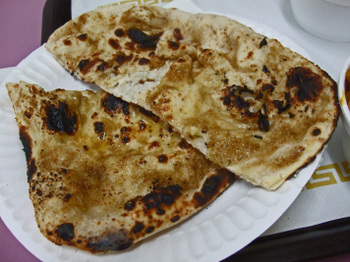 The Naan was rolled out and cooked in the Tandoor to order and you get it hot and crusty. It also helps that there is always a generous amount of garlic and herbs on the naan. I usually enjoy watching the Naan cook in the Tandoor, but this time the Cook gave me an annoyed look when I moved over to watch him. I guess the attitude was transferred along with the ownership of the restaurant. We probably won't be back, at least until we're prepared to deal with the attitude again, which may be a while. 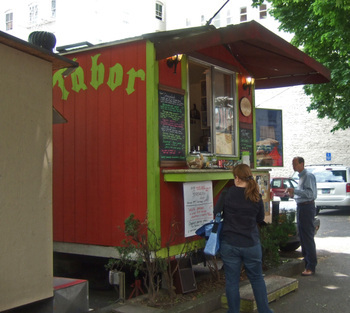 Some Notes: Tandoor is not a sit-down restaurant, but closer to a "fast-casual" style eatery. There's a Saturday Dinner Buffet and Sunday Brunch for $7.99. 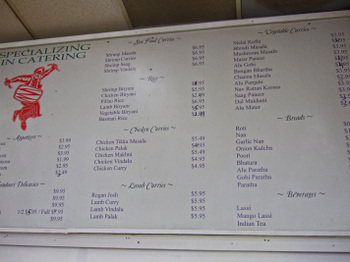 The menu is quite extensive with over 70 items. The strip mall that Tandoor is located in can be a real zoo during lunch hours and during holiday season. Getting back to Friars Road from the parking lot can also be somewhat frustrating at times. After leaving Ashoka the Great totally stuffed, we decided to take a walk around Little India Center. After stopping to do some shopping, we came across the Ker-Little India Superstore. I don't recall seeing Ker on previous visits, so we walked past the adjoining vegetarian buffet, and while the Missus went to purchase some desserts from the dessert counter("ooohh snacks..."), I went to check out the rest of this very large warehouse sized grocer. I could tell by the signage, that items and shelves were still being moved around. With palates of rice and other items being carted about, things seemed to be in a transition stage. I was told the these were a variety of Bittermelon. The isle of spices seemed to go on forever. I'm fairly certain that whatever Indian spice you might need, that you'd be able to find it here. And several varieties of each. I've hesitated in attempting to make Indian dishes at home, using the "possible" inability to access some of the spices as my excuse. Well I guess that's another excuse that bites the dust. I was totally amazed at the 2 isles of packaged and ready to eat food available. Many brands, many boxes, where to start? Indian Style Chinese Hakka Noodles, anyone? Leave it to me to find Chinese Food anywhere! Has anyone tried these? There was Indian Style Kung Pao as well. About this time the Missus turned the corner, munching on some Indian sweets, poking me on the shoulder to awaken me from my dazed circling. Apparently she had done pretty well at the desserts counter Herself, as was in the process of tasting everything she had purchased. As we left the store we stopped and checked out the Vegetarian Buffet offered by Ker($6.99). It looks like we'll give it a try in the near future, so I'll save that for another post and another day.